Today I have an interview with Philipp Neitzel who contacted me about a supplement on Kickstarter for The Dark Eye [TDE], The Warring Kingdoms, from the publisher Ulisses Spiele. I was intrigued because The Dark Eye isn't something I've seen much about. This supplement to The Dark Eye follows up their Ennie-nominated setting, The Dark Eye: Aventuria Almanac. It sounds like a great project and I hope you enjoy reading what Philipp has to say! Tell me a little about The Warring Kingdoms. What excites you about it? The Warring Kingdoms Nostria and Andergast are part of The Dark Eye’s core setting, the continent Aventuria. They are two smaller realms caught in a hateful struggle that has been going on for generations. Taking a toll on the countries, depriving them of economic and social growth. Neither Nostria nor Andergast are in the focus of sweeping metaplot events or the plans of bigger realms. They are very much focused on each other. The setting very much is a down to earth approach to fantasy, going for a middle ages feel. It feels grounded, lived in and true to life and human experience. It is a setting where nature, history and magic have their own mysteries and where war has a real cost. But without going grim dark with it. There is room to be heroic and for good people to succeed in the end, even if not everything is black and white and there is room for moral choices to be made. 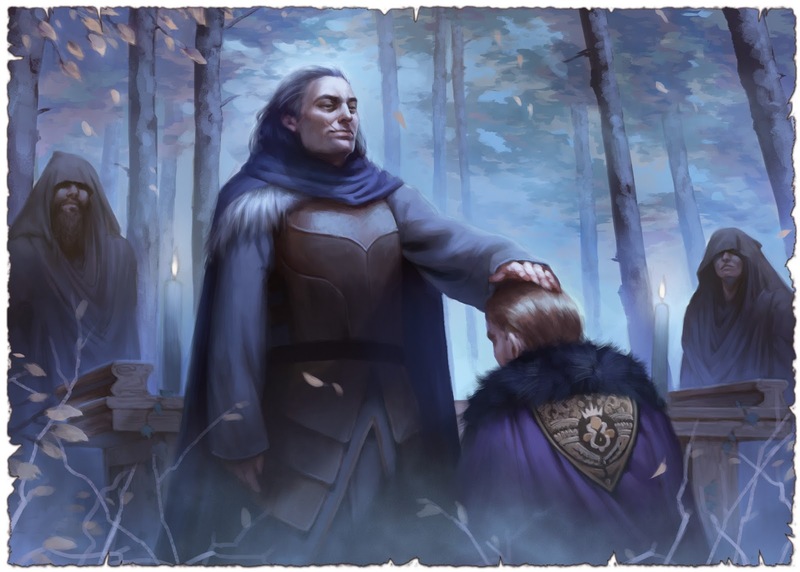 This medieval fantasy feel is showing in the artwork and the text, making Nostria and Andergast into specific places and not just pastiche. There are a lot of elements and plothooks in the setting that I am really excited about. Like the city of Nostria ravaged by a plague a few years ago and in decline since, with empty rows of houses that serve as home to gangs of criminals. The labyrinthine castle above the city home to the educated Queen Yolande, trying to be a wise ruler to her backwards country. The storm swept coast, where free farmers are holding back the sea by building dykes. Something that speaks to the northern German in me. The deep and endless forests and what might lurk within, places where nature makes all manmade borders obsolete and the woods themselves are the true sovereign of the land. Personally I also like how The Warring Kingdoms as a setting allows us to examine accepted fantasy tropes. There is a lot that sounds very familiar here. A feudal order, knights, kingdoms in endless conflict. But the way it is portraited [portrayed] and rooted in the setting gives it weight and allows to ask questions. The feudal order is just as playable from the peasant perspective and what it means for them. The wars take their toll, yeomen are recruited to fight, farms and castles are damaged. Conquered villagers have to swear fealty to a new liege. But there also is an emotional cost. The inherited hate and prejudice after generations of fighting, even if in the borderlands only the rulers are changing and cultures are mixing. Where often picking a site in the conflict would be the only way to go, striving for peace, however uneasy it might be, and an understanding between cultures is portraited [portrayed] as just as viable as becoming a war hero. War itself is, unsurprisingly with a title like The Warring Kingdoms, one of the big themes. It will never be truly won or over. The war is as much a force of nature and creeping background threat as a sandbox to play in. But to give a heroic fantasy aspect to it there is a totemistic aspect to the war as well. 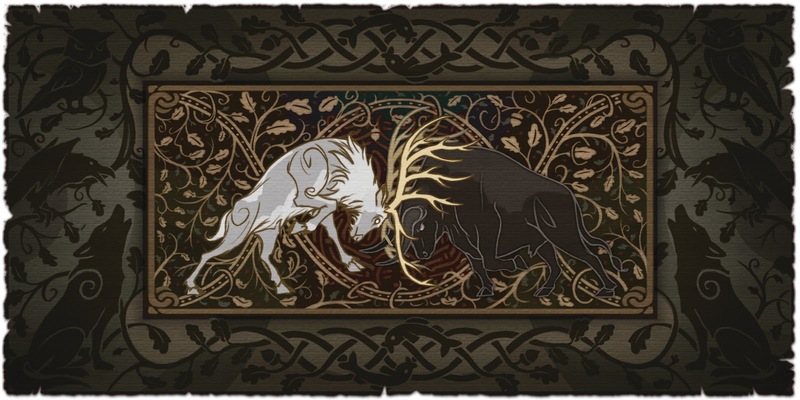 An ancient quarrel between Animal Kings, the firstborn of their species and a mythic Root of Hatred the players can engage and appease. But even if they succeed there still is the resentment of generations at war, looping back again and grounding it in human experience. Another trope that gets examined is gender roles in the tropes of medieval fantasy. Aventuria as a setting has been explicitly equal rights since it’s development in the 80s. Allowing for female fighters, rulers and artisans on the same footing as their male counterparts. Andergast however is one of the few patriarchies on the continent. Which culturally isolates them from their neighbors. By putting them next to and in conflict with Nostria it put “medieval” gender roles in contrast with a emancipated society and shows their injustice. But without painting every Andergastan as an evil cliché. It is an aspect of their culture, that is hard to unlearn and without contact to others not often question. Cultures are an important part of a The Dark Eye character and have weight in the rules on equal footing with their species and profession. So you are not a human fighter but an Andergastan Forest Knight and the Warring Kingdoms gives this culture weight and a setting to use it in. As a supplement, how does The Warring Kingdoms integrate into The Dark Eye? What makes it unique beyond other settings and supplements? 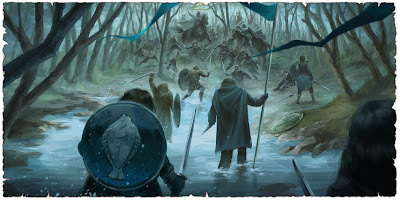 With Nostria and Andergast focused on each other and the region providing a lot self-contained of hooks and conflicts while on the surface level fitting the European flavored take on a medieval fantasy setting, The Warring Kingdoms work well as the first regional supplement. Before this we had the core rules and the Aventurian Almanac, describing the whole continent, in less detail for each of the regions of course. With The Warring Kingdoms we are zooming in on this two realms and the setting they provide. They are not only geographically in the same place but united by narrative themes and a similar feel. You will just need the corebook and to a lesser extend the Almanac to get full enjoyment from The Warring Kingdoms, everything that you need to know and all rules to play in the setting are collected in the setting supplement. But the setting book is not the only thing that we offer. In the Kickstarter it comes with a adventure modules for the region and playing into the themes. New Bonds and Ancient Quarrel for example is about securing an uneasy peace, starting with a political marriage. We also provide a novella and a comic set in the Warring Kingdoms and, if our backers are generous, a soundtrack album. So there is material to engage with the setting in a lot of ways. The setting book being the core and working on it’s own. So within The Dark Eye you are getting a lovingly detailed and ready to play setting. I would say the european, specifically german perspective on a grounded, sometimes fairytale like medieval fantasy setting. Written by people who just need to walk a few steps to get a view on a real life castle. We are inspired by different landscapes, our own culture and history, when writing fantasy and I think it shows in a lot of small details. How have you made The Warring Kingdoms mechanically interesting, beyond just being part of The Dark Eye? Are there new items, new roles to play? The Warring Kingdoms are introducing rules that support and reward thinking about your character’s culture. There are traits you can pick that give you a little bonus and a little drawback for something that is typical of your culture. Using this rules we are also giving an identity to the culture of smaller regions within the Warring Kingdoms. While the core rules only featured Nostria and Andergast as a whole. That way the verbose Nostrians can lose time when a skill check involves talking but depending on fishing for a living they get a small bonus for that. 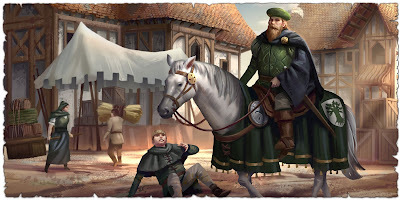 While Andergasters from the eastern Steppes are not just stubborn than the rest of their culture they also deal with horses for a living and get some bonus there, but their rough homeland and dealing with orcs gives them less courtly manners. So small mechanical benefits that also tell you something about what life in that character’s homeland is like. We are also featuring new schools of magic for mages and new familiars for witches supported with some new spells. If you want to throw exploding fireballs as an Andergastan battlemage or if you want an owl friend as a witch of the Silent Sisterhood, this book has you covered. As a faction important to the setting we are introducing druids as a new school of magic with their own set of rituals, spells and tradition. Our druids, called Sumes in the Warring Kingdoms because they worship the earth goddess Sumu, are more like the priest of celtic and pagan Europe than the shapeshifters of D&D. New items are featured with all the rules to use it and some description in the sourcebook. But if you want even more details we also offer the Armory of the Warring Kingdoms with illustrations for each piece of equipment and some optional additional rules and some deeper descriptions. There are of course weapons typical for the Warring Kingdoms. Like the Nostrian long bow or the Andergaster, a 7ft long two handed sword. But there are everyday items as well, like clothing typical for the Kingdoms, tools to build a dyke or works of art. 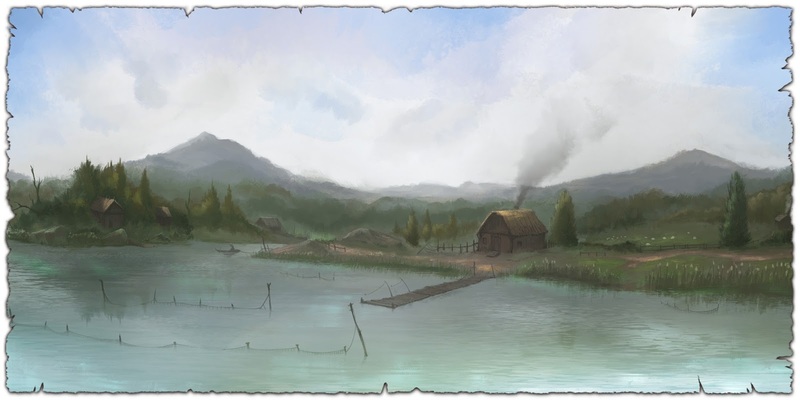 What inspiration have you used to develop the setting of The Warring Kingdoms? We had a history to build on, since the setting, like most for The Dark Eye, has been around for some decades. People used it before, first as a setting for novels and later adventures. There has been another sourcebook describing it, as well as the computer game series Chains of Satinav. So we could build from there and expand on those ideas. But of course we did set the focus to support the themes we found interesting and wanted to put a spotlight on. Another goal was to describe those things that enhanced the play experience foremost. As a feudal setting with knights, longstanding feuds and wars we of course took inspiration from classic tales about knights. So even if the setting is not Arthurian there is some inspiration to be found. We of course couldn’t ignore Game of Thrones. But Grimm’s fairytales and Ottfried Preußler’s Krabatt and Astrid Lindgren’s Ronja the Robber’s Daughter did lend a lot of inspiration as well. European history and the image we have of the middle ages as well as real historical research also played a big role. Some sources on inspired certain elements of the setting. You can find a lot of the hanseatic city of Bremen and its harbor Bremerhaven in the trading hub Salta and Slaterhaven for example. While the steppes of Teshkal in Andergast are in a lot of ways draw inspiration from Rohan in the lord of the rings, which is not as big an influence on the rest of the setting. Do you think that there are significant differences between The Dark Eye and USian games like Dungeons & Dragons, and that this has influenced The Warring Kingdoms? I think there is a difference in playstyle that developed over the years and influenced the design decisions that went into creating the rules for subsequent editions of The Dark Eye. TDE is less combat and encounter focused in it’s scenarios. Instead pushing for engaging with the background, it’s lore and NPCs. There are a lot of social challenges in adventures for the dark eye as well as a big metaplot that often is featured and engaged in published scenarios. But there is also room to just experience the world, featuring scenes of exploration, fluff and sight-seeing. Which is something our players enjoy. There are of course American settings that do similar things Glorantha comes to mind as a setting with very deep lore and the World of Darkness featured a metaplot. But The Dark Eye as the defining game of the market it changed what mainstream assumptions look like in Germany and is it’s own mixture of stylistic elements. Of course this influenced The Warring Kingdoms. To provide a working metaplot you have to give players room to do their thing and be the most important people in the setting, at their table at least. But you also have to give a few hints at what can happen in the future. So we have to decide what to hand over to the players and never touch again, so they are free to use it and what to point out as something that we will pick up in the future. We are marking NPCs with chess pieces for example. A pawn we will not mention again, a knight will remain in the setting but can for the plot be easily replaced with any npc the GM likes, a king will be important later on and it is important for later developments that this person show up in this scenario. So metaplot considerations featured into designing the setting. Within The Dark Eye the setting is trending towards being less metaplot heavy and leaving a lot in the GMs hands. We still put in a few hints that will keep people interested in what the future holds. The description of the setting is providing plot details as well as challenges and conflicts as well as a lot of cultural details and interesting fluff. Necessary to explore and feel the setting through your characters perspective or to give a deep background to your character, even if you play them in another culture. So The Warring Kingdoms is not only describing a field to play in, a destination to travel, a series of storyhooks or a set of difficulties to measure up against but also a lens through which a character can experience the world. What do you mechanically to handle social interaction in The Dark Eye, and how is it reflected in The Warring Kingdoms? What influence does the setting have on the understanding on the mechanics for social situations? It can be done done as a skill check, where we have a variety of skills divided by approach. Either as a contested check between two characters (PC or NPC), just going for a success and seeing how good you rolled or a long time task, where you are accumulating points, till you reach certain milestones for a full or partial success. Each of these three core mechanics are there for every skill check. They can be applied to social interaction depending on what your goal is. The quick roll for a success works best if it isn’t too important how long a task takes and what the other character is doing. The contested roll is important if you want a defense and to compare two characters against one another. It is used between player characters or between player characters and important NPC. The long term task works well if you want to convince people over time, turn asking around for information into a montage or do other long term things like counseling someone in a time of grief. There also is a ladder of attitudes people can have towards each other ranging from bitter enemies to unconditional love. You can roll to move people along that scale or to just get them to do something. Which gives more of a choice and makes a difference between long and short term goals. Those rules are covered more in depth in the Compendium, which is not yet released in English. Your social status and other traits modify your roles or sometimes allow you to roll for things you otherwise wouldn’t be allowed to roll for. In The Warring Kingdoms it is important where you stand in the feudal hierarchy. A peasant will have trouble addressing the Queen in a forthright manner and it would be a harder roll for the player. But if the peasant plays into his lower status and pleads instead of demanding, that might make the roll easier. On the other hand the Queen will not have it easy if she is trying to speak with the peasant as equals or if she attempted to mingle with criminals to gather information. It is a medieval world, with distinct social classes, which is reflected in the mechanics. But we also allow characters to rise above that system and interact as people. There are a few scenarios where looking beyond the feudal system and showing compassion for both sides will lead to the best outcome. Still feudal rule is normal for most of Aventuria and certainly The Warring Kingdoms. For The Warring Kingdoms specifically we used some mechanics to have the rules interact with the themes of resentment and enmity between Nostria and Andergast. The cultural personality traits we talked about can provide hints how to play a character from a certain region, also having a small mechanical impact. One trait you can pick up for any Nostrian or Andergastan is the inherited hatred between them. So interacting peacefully with someone from the other country gets a bit harder. There is a “animosity track” you can use to see how much a character is influenced by hate and to reduce it or raise it in steps by using social rolls. You can tie this into the mystical background of the Root of Hatred as well. There are a lot of modifiers and use cases for the rules described in the core book that come from The Warring Kingdoms but the core mechanics remain. Rather traditional skill check, social class, culture and approach matter. There are a few ways to have more than binary success, like the animosity track, long-term tasks or the attitude scale. Tell me more about the schools of magic! What can you tell me about new familiars and druids? How do they interact with the setting and mechanics? The background of The Dark Eye determines what approaches there are to magic. There are different of traditions that shape how your character casts their spells. Shaping the general outlook a spellcaster has as well as some of the flavor of casting spells. Like if they need incantations, gestures or just force of will. The guild mages have a scientific approach to spellcasting, write books and have academies. There are three recognized guilds of mages, all with protection by the laws. Except in Andergast, where those laws never were established. Still there is an academy in Andergast, the Combat Seminary. The mages trained there are ready for war and the rough manners of a rough land. They do not seem like your typical bookworm, instead often serving with the Andergastan troops, using their staff and magic as weapons in the skirmishes against Nostria. They have some of the most destructive spells in the system in their grimoire. So an Andergastan Guild Mage is a good pick for a fighting adventurer. Nostrian mages are very different. Supported by Queen Yolande, who graduated from this school, they study the history and hidden magic of the land. Called the Academy of Light and Darkness they use magic of both as well as magic that transforms objects and the environment. The worldview taught at the Academy is one of strict dualism and a divide between good and evil. They are a good choice to play an academic character in the backwards Warring Kingdoms and someone whose assumptions about the world will be challenged outside the university walls. The tradition of the witches is more guided by intuition, being in tune with your familiar and the sisterhood of witches that share the affinity to your type of animal. A witch can conjure curses on people they dislike, they can fly on a wooden item (not necessarily a broom) and of course cast spells. They lack the protection by the laws but in Nostria they are not persecuted or anything but respected as advisors and a power factor. We introduce the Serpent Witches in The Warring Kingdoms. A member of the Sisterhood of Knowledge they have snake for familiars and are hungry for knowledge, sometimes dangerous knowledge and known for knowing a lot of secrets. They have snake, divining and disruptive magic. The owl witches of the Silent Sisterhood are secretive, at home in the wide forests of the warring Kingdoms and sworn protectors of all witches. They do hunt down witch hunters and other enemies of their tradition. They are seen as the best fighters amongst the witches and their magic supports this a lot it buffing her abilities in combat. Growing claws, running up trees or making branches attack their enemies. The witches are the most important tradition in Nostria. Attuned to the land and revered by it’s inhabitants. Witches being predominantly female, even if other gender identities are found in their ranks, they are a good counterweight to the Andergastan patriarchy. 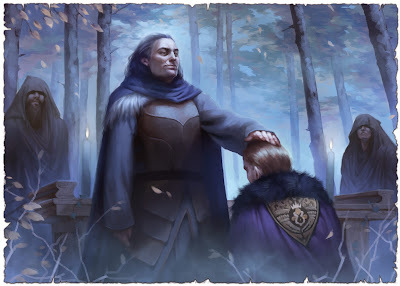 Andergast’s most important tradition are the druids or “Sumes”,as they are called in the Warring Kingdoms, they influence and advise the king and are seen on par with clerics of the gods, speaking for the earth goddess Sumu. They can influence people’s mind with rituals and use magical obsidian daggers in their spellcasting. Still their magic is attuned to the forests of their homelands which they protect. The Sumes speak for the forest and can decide if trees are to be cut down or animals to be hunted. A privilege that can get them in conflict with nobility. There are two factions of druids in Andgergast, the servants of Sumu, who are like I just described them, whose magic is of the forstes and the elements. They usually genuinely want to protect the land and keep Sumu, who they see as a dying goddess alive. The Augmenters of Power are different, in method and often motivation. They still are Sumes and seen as envoys of nature but their magic is more about influencing people. They can tell if someone is lying and cause fear or confusion. Most of their spells take control of someones body or reactions without outright dominating their thoughts. Their workings and intrigues are a big part of the setting and tied to the Root of Hatred. Even if they still try to save the land, most heroes will question their methods. Thanks again to Philipp for the interview, and I hope you all enjoyed reading! Check out The Warring Kingdoms on Kickstarter now, and remember to take a look at the Adventuria Almanac's Ennie-nominated setting!